A recent post summarised a number of Events of Interest to Institutional Web Managers. Of more relevance on, perhaps, a daily basis will be the mailing lists which enable web managers to ask questions and engage in discussions with one’s peers. Jiscmail (and its predecessor Maibase) is a long-established service for hosting mailing lists on behalf of the UK’s higher and further education communities. The web-support list was set up on Mailbase, probably in 1993 or 1994. 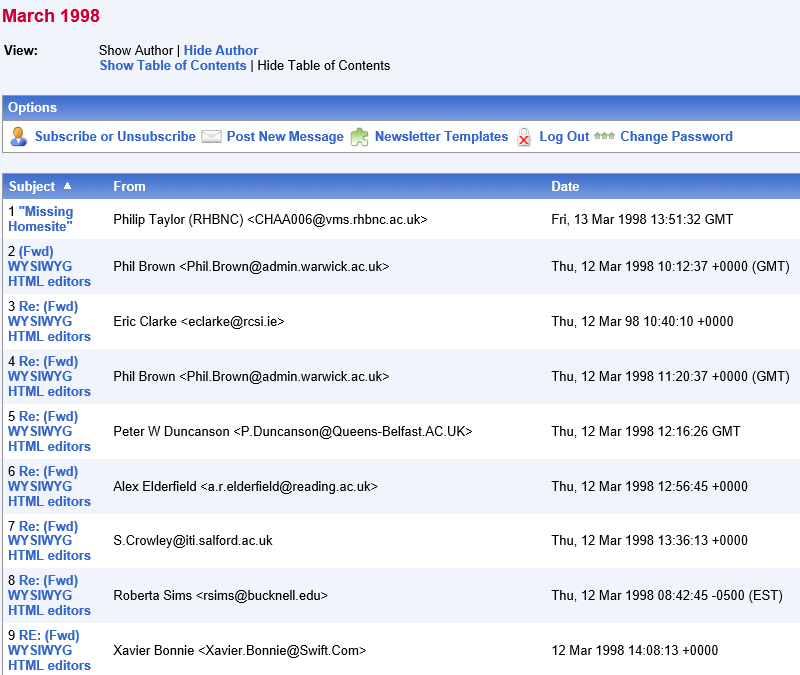 The original archives no longer exist (and were possibly lost when Mailbase lists were migrated to Jiscmail). However as can be seen by looking at the oldest archives, from March 1998 this mailing list helped establish a supportive environment for those working in institutional web management teams. The website-info-mgt list was set up sometime after the web-support list (possibly around 1994) although, once again, the archives are incomplete and only date back to September 1998. The website-info-mgt list was set up to complement the web-support, providing an environment for discussing strategic, managerial and other non-technical issues, with the web-support list focussing on technical issues. List for the UK Higher and further communities to discuss all aspects of managing institutional Web services, maintaining the information, developing and managing web services, dealing with organisational and management issues and sharing of relevant experiences of maintaining a large information system. Currently the web-support lists has 496 subscribers and the website-info-mgt has 570 subscribers. In addition to these two main lists for institutional web managers, as might be expected there are a number of other Jiscmail lists which discuss web-related issues. A search for Jiscmail lists which contain ‘web’ in the list name or description identifies a number of lists which may be of interest, such as the FE-WEB-DEVELOPMENT, SCOTTISHWEBFOLK, WEB-NE-REGION and LIS-WEBPEOPLE lists which may be of interest to those in the appropriate sectors and regions. A post on “The Decline in JISCMail Use Across the Web Management Community” was published on the UK Web Focus blog in June 2010. 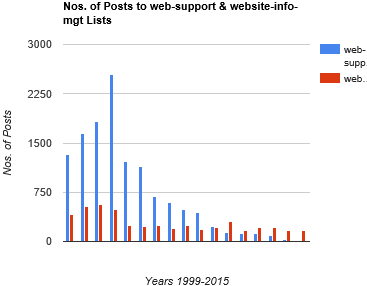 A recent update on the numbers of posts to the web-support and website-info-mgt lists was published in a Google Spreadsheet on 11 February 2016 and, as should in the accompany graph, the numbers have now stabilised at a much lower level than the peak around 2001-2002. The lists are now normally used for announcements, with little discussion taking place. 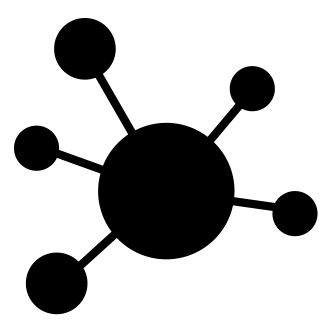 Online networking for professionals in the IT, Design, Marketing area within HE in the UK. This is a place to discuss issues, share ideas and ask questions. However the group currently only has 89 members, significantly lower than the members of the Jiscmail lists. Higher Education Marketing & Communications: An international group which is “designed to foster connections between Higher Education Marketing and Communications professionals. It is predominantly aimed at recent or active practitioners, sharing best practice and information about the sector as well as to assist in professional and career development“. Currently has 20,498 members. Web 2.0 for Higher Education: An international group which is “for anyone interested in how higher education is utilizing Web 2.0 communications and fundraising. Members can post resources, share information and/or ask questions or seek advice“. Currently has 2,713 members. Digital Analytics Association: An international group for which the group description begins “The DAA was founded as the Web Analytics Association in 2004“. Currently has 17,526 members. Web Standards: An international group for which the group description begins “The mission of the LinkedIn Web Standards Group is to promote Web Standards as defined by the W3C“. Currently has 20,025 members. Web Accessibility: An international group for which the group description begins “This group would connect people interested in Web Accessibility“. Currently has 7,114 members. This post summarises some of the main mailing lists which can support institutional web managers in UK higher and further education. If you know of other mailing lists of interest, please leave a comment. However it should be noted that use of mailing lists appears to have declined significantly over the past 10 years. A follow-up post will explore social networking services which may be more widely used by University web managers. [Note follow-up posts on “Blogs and Institutional Web Managers” and “Social Media For Institutional Web Managers: Twitter” have been published].